Step 2. Click on "Tools" at the top, and select "Accounts" from the list. Step 3. Click on the "Mail" tab. Step 4. Click on the "Add" button to the right, and select "Mail..." from the list. Step 5. For "Display name", type in your name; click "Next"
Step 6. For "E-mail address", type in your CedarNet email address; click "Next"
Step 7. 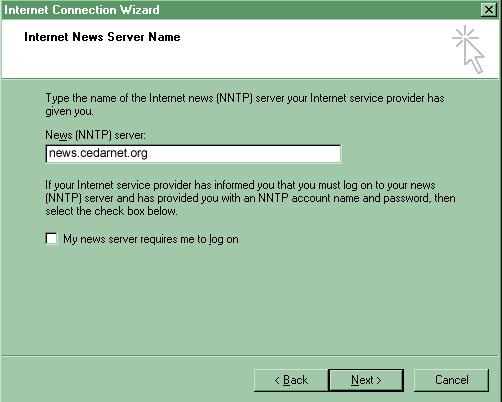 For "News (NNTP) server", type in news.cedarnet.org click "Next"
At this point the newgroups should load, and you should be set!